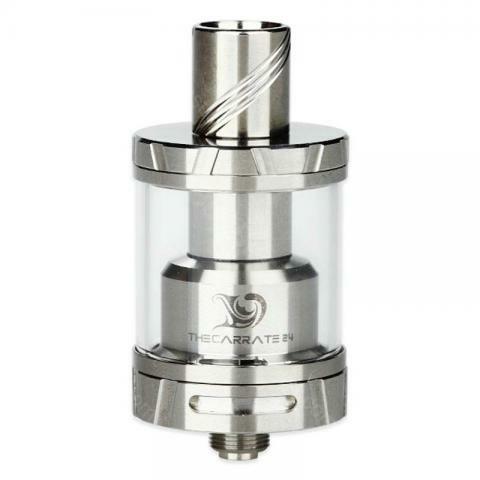 Tesla the Carrate 24 RTA is a rebuildable tank atomizer, it features 24mm in diameter, 2.5ml capacity, bottom airflow, anti-leak and top filling design. It is perfect for those who is looking for a cost effective anti-leak RTA. Tesla the Carrate 24 RTA is a rebuildable tank atomizer, which has an innovative RBA base that greatly simplifies the process of rebuilding wires. Most types of coils can be built easily because of the brand new innovative building deck design. Featuring with 24mm in diameter, maximum 2.5ml capacity, adjustable bottom airflow, internal anti-leak and top filling design, it also included a delrin drip tip that works to prevent heat airflow. Providing expansive building capabilities, the Tesla Carrate offers optimal space for larger builds of virtually any coil type. And you can use high VG liquids at high power in The Carrate 24 RTA as the large wicking holes will provide ample space for the complete evaporation e-juice. It has bottom airflow with two large air slots to ensure smooth airflow. This Carrate 24 is perfect for those who is looking for a cost effective anti-leak RTA, and will provide you superior vaping experience. Ich habe mich für Tesla The Carrate 24 entschieden, auf Grund des Preises, Aussehen und Geschmacksrichtungen. UND, ich bin begeistert, super schnelle Lieferung. Tesla The Carrate 24 RTA Atomizer is proved with the code on package, excellent quality and design, easy to use.